Time to take off the tinfoil hat. Location Services have been available since the first iPhone. While it wasn’t the most advanced at that time, things have progressed significantly since then. iOS 7 brings the most integrated and expansive set of features to mobile devices. For new users who are experiencing Apple for the first time, it can be overwhelming. 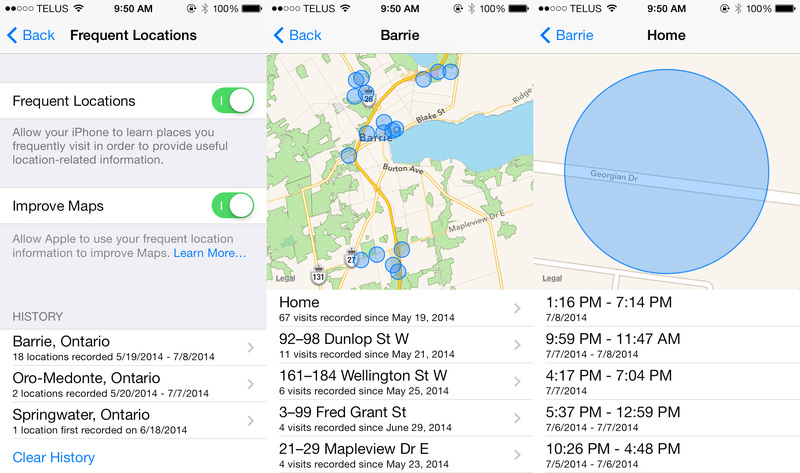 If you’ve never been accustomed to location services before, it can also be intimidating. Who’s watching? What are they able to see? Can anyone track where you go? These are concerns I hear from new iPhone owners, so I’ve made this guide to help put those matters to rest. 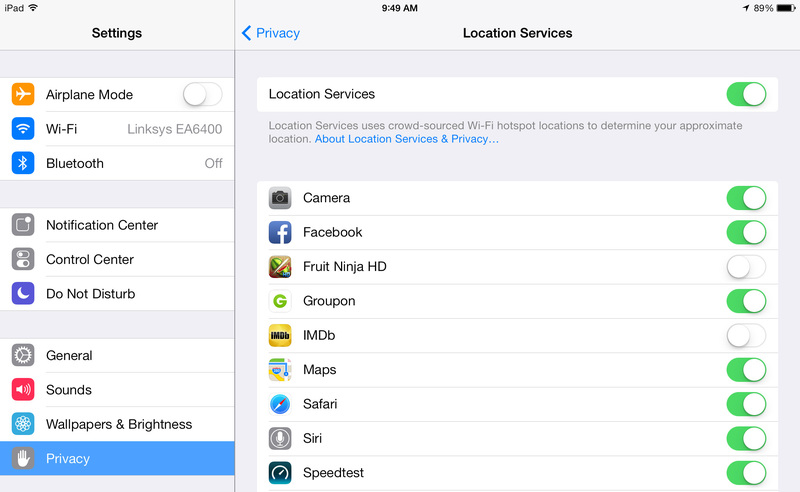 Configuring location services can be done within the Settings app. By selecting the Privacy section a few rows down, you’re presented with many different options. iOS 7 enhanced this category by adding customization for apps that use specific information on the device, including Contacts, Photos, Motion, and even the Microphone. You can restrict or allow individual apps in this menu. Each app will request permission for the data it requires when it’s first launched. By selecting the location services menu, it will guide you to the list of apps that are using GPS location for any reason. One major concern that I’ve heard is the fear of high battery usage. I can confirm that using location services will not cause a noticeable drain on your battery. It’s designed to be an integral and necessary part of the device. Disabling it completely will only restrict it’s core functionality. All of the information collected on the device is for your own personal use. You have the ability to share your location with friends and family but it must be enabled manually. There are a few different types of location alerts. An arrow will appear in the status bar beside the battery indicator while an app is currently using the service. When viewing the list, apps that have a solid purple arrow are currently using your location. If there is a grey arrow, the app has used your location within the last 24 hours. Make your iPhone work for you. The outlined arrow represents a geofence. These are unique conditions set by apps that will trigger an event when entering or leaving a certain area. An example of this would be with my Philips Hue lights. I’ve set a geofence that will turn the lights on when I enter my house. Reminders can also be set to alert the user when they reach a destination. When a geofence is active, you’ll notice the outlined arrow in your status bar. Having these enabled will not cause stress on the battery. It only acts as a trigger for the action it’s set to accomplish. Some apps can cause trouble. There are situations where developers are inattentive and add in location services without reason. This leads to consistent tracking or displaying misleading information. The best recommendation I can give is to browse through the list of apps that have requested use, then disable ones that don’t serve a purpose for you. Stock apps are always suggested to leave such as Safari, Maps, Camera, Weather, and Siri. Apple has precisely designed them to be efficient and beneficial. Only consider apps that have been downloaded from the App Store. Most games and informational apps such as a dictionary or word processor have no use for it. No private information is shared through the location, and in most cases it only retrieves the city you are in. A few examples of this would be Best Buy, Groupon, or Yelp. A unique feature to iPhone specifically is Frequent Locations. It is enabled by default, and will show you locations that have been visited for extended periods of time. I’ve left it on since acquiring my iPhone 5s in September, and noticed that it only saves 2 months of collected information. After hearing opinions from different people on the subject, I seem to be one of the few who finds it interesting and has it active. It will display cities in the first menu, then parts of each city in the next section, followed by a list of dates and times for each specific location. I was impressed at how detailed it is. This information is paired with the predictive time feature found in the Notification Center. If you’re away from home, it will display an estimate of how long it will take to return. This also works in conjunction with turn-by-turn directions in the Maps app. If traffic is building up in a certain area, a new route will be created. This is a perfect example of how integrated location services are into the device. Location awareness is growing each day. With the introduction of wearables, location services are only going to get bigger. Developing an understanding of how it works now will put you on the right path for making the most of it in the future. Simply disabling it completely because of intimidation is not the best solution. Take the time to understand how these great features work, and you’ll feel better about owning your iOS device.